I have said it before and I will say it again, human nature is a wonderful thing. In the past few days we have been at the receiving end of so many kind words, heartfelt cards and beautiful gifts from so many, on the opening of our tea shop. It never ceases to amaze me the lengths people go to in order to pass on good wishes, to say thank you, or just to encourage you to keep going. I will tell you about one act of kindness we have experienced, only yesterday. Last summer whilst Wendy had the opportunity to put a few tables out in the garden and serve cream teas and sandwiches, we had a really good response from people coming to sample her delights. Some people would come back again and some people would come back many times. One such lady, brought her daughters, on other occasions she brought her friends and on one occasion, even brought her hubby. Well, on one of these occasions, whilst in conversation, the lady spoke to us about her hobby of needle felting and how she had been bitten by the bug. We even gave her a big bag of hair, the result of grooming our Ginger Cows, so she could use it in her work. Wendy subsequently bought some things from her, for our home, some felted cattle and pigs and they are so life like, just so much smaller. Anyway, yesterday, after being reopened only a few days, this lady, Maxine, reappears once again with her family. You could see she was excited to be back and said that she had brought us a little something. A little something! She, no word of a lie, must have spent weeks and months on this little something. 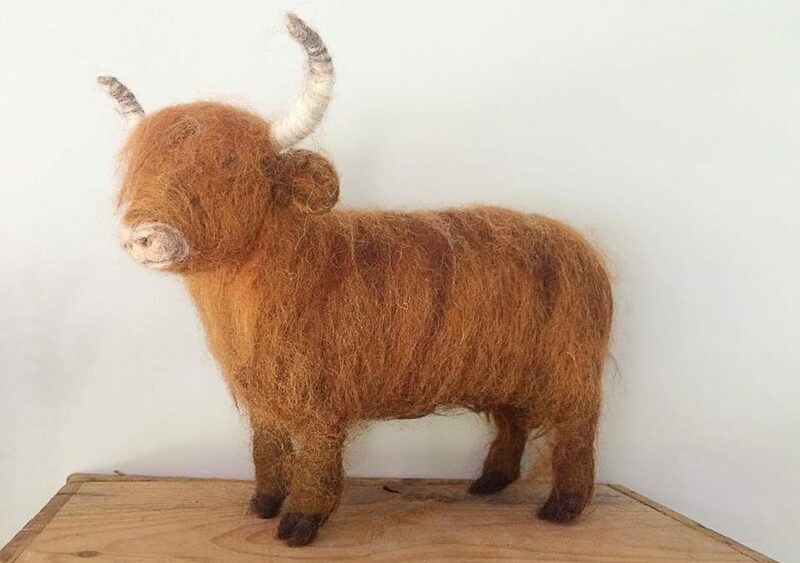 What she brought us was a handmade replica of a Highland cow, which she had made. We now need to find somewhere fitting for this beautiful gift, in order to show it off. So do look for the cow when you come to visit. On a sad note, two of Betty’s ducklings disappeared this week. I suppose it’s inevitable in a place like this. She does insist on wandering all day, dragging her babies behind her and there are so many opportunities for the rascals to strike and take them away. I never knew how jealous some animals can get. This week I have been hell bent on getting all of our Highlands groomed and all the knots taken out of their coats. And I mean knots – it’s the remainder of their winter coats. We have four daughters and I have experienced many a knot on bath night when they were having their hair washed, but this is a whole different kettle of fish, let me tell you. Anyway, I was sorting out Morag’s coat, minding my own business, when all I could hear was Maisie and Lucy, the ponies in the next field, moaning a bucket load. What on earth’s up with them? I kept going, but they kept whinnying. Eventually, although I wasn’t sure, I thought I had worked out what the problem was. I downed tools and escorted them out of the top field and back to the stable area. I then brought out the box holding all their grooming paraphernalia and only then did they shut up. I was correct in my thinking and all the time they had been jealous that the cattle were being groomed and not them, the little monkeys.